When you’re pregnant, your thoughts are understandably focused on keeping your baby safe. You probably wonder if routine activities, such as going to the dentist, can be harmful. Can you go to the dentist while you’re pregnant? 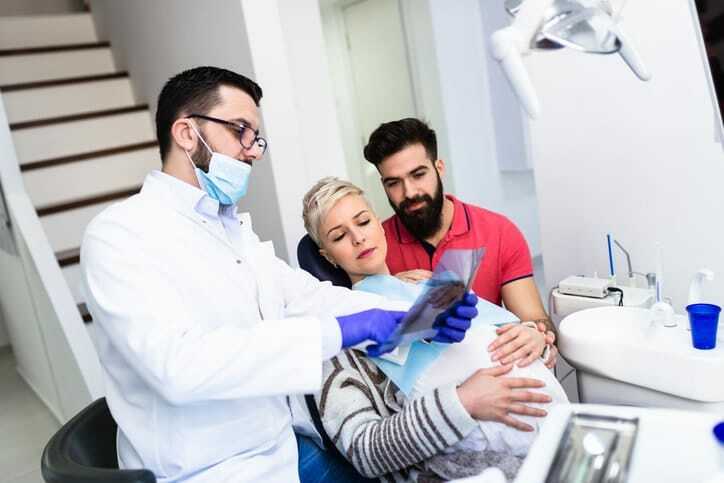 Not only can you go to the dentist while you’re pregnant, you should definitely go in order to receive a preventative dental cleaning and exam. That’s because in addition to affecting many other parts of your body, pregnancy can also affect your oral health. We encourage you to have a dental checkup early in the 2nd trimester (when treatment is most advisable) because once your new baby comes, you’ll likely want to make sure you can spend all of your time and energy caring for your bundle of joy—and for that, you’ll want to be in your best shape possible. Why is important to tell your dentist you’re pregnant? While you should go to the dentist while you’re pregnant, you should also make sure to let your dentist know if you’re pregnant – or even if you just think you might be. That way, he or she can determine what work needs to be done and can be done safely and what should be postponed. For example, if you need a cavity filled, it should be taken care of to reduce your chance of developing an infection. Emergency work such as a root canal may also be necessary, and your dentist will let you know if this is best taken care of as soon as possible or if it can be delayed. Elective dental procedures, such as teeth whitening, should always be postponed until after your baby is born. What are some common pregnancy-related dental problems? During pregnancy, your rise in hormone levels affects your gums. They’re more likely to swell, bleed, feel irritated, and trap food. Your hormonal changes can make it easier for plaque to build up on your teeth and cause gingivitis if your teeth don’t receive the treatment needed, and this condition has been linked to pre-term birth. You also may have an increased risk of getting cavities while you’re pregnant. You may be craving and eating more carbohydrates than usual. And morning sickness can increase the amount of acid in your mouth, which eats away at the enamel of your teeth. In addition, your oral health may not take priority while you’re pregnant. The thought of brushing and flossing may make you want to gag, and your tender gums may make you want to skip your regular routine. What are some possible concerns about dental visits during pregnancy? If you do need to have dental work during pregnancy, your dentist should use as little anesthesia as possible. But it’s important that any stress or discomfort you’re feeling – which can also affect your baby – is reduced. Routine X-rays can usually be postponed until after your baby is born. But if you have a dental emergency, your dentist may need to perform an X-ray. With appropriate shielding, this is considered safe for your unborn child. Some types of medicine shouldn’t be taken during pregnancy or only during certain trimesters. If you need medication, your dentist can consult with your OB-GYN before prescribing any medication for you. Make an appointment or stop by Dental365 in NYC today for a routine cleaning and exam. We’ll work with you to determine what, if any additional treatment you may need and if it should be performed while you’re pregnant or can wait until your baby’s born. Our numerous dental offices are located throughout the metro New York area, and we’re open seven days a week and have extended weekday hours as well as emergency services available. Fill out the form on this page to request an appointment or call 844-365-DENTAL to learn more.